Alfalfa (Medicago sativa) is an herb cultivated primarily as fodder for cows and other animals, but it also has traditional uses as a medicinal. Unlike many other herbs, all of the plant is used as medicine, but the tea is typically only made with seeds or dried leaves. The uses for alfalfa tea to treat illness and benefit health primarily remain in the realm of folk medicine, but alfalfa leaves contain many beneficial constituents that may assist in healing and promoting health. Alfalfa tea is considered relatively safe, but consult your doctor before taking it if you are on medication, pregnant or suffer from a chronic disease. Alfalfa tea has a long history as a health aid, although its medicinal use is limited in comparison to many other herbs. Traditional Chinese medicine, for example, uses the tea to stimulate the appetite and relieve ulcers, as well as treat other digestive disorders and kidney problems. Traditional medicine in India -- known as Ayurveda -- uses alfalfa leaf tea to relieve water retention and treat arthritis and ulcers. Colonial Americans used the plant to help fight scurvy and as a treatment for menstrual disorders, arthritis and urinary problems. Studies on alfalfa tea have shown mixed results. For example, according to MedlinePlus, there is insufficient evidence alfalfa is a viable treatment for its traditional uses, as well as a treatment for prostate issues, asthma and diabetes. Smaller studies have indicated that alfalfa seeds can reduce the amount of cholesterol in the body for those with high cholesterol, but more research is required. A study published in 2012 by the Institute of Soil Science and Plant Cultivation in Poland, however, suggested that preclinical research indicates that alfalfa leaf extract enriched with vitamin C supports the human body in fighting malnutrition, ischemic diseases and various disorders of the digestive tract, as well as supporting and enhancing immunity. Ischemic diseases restrict blood supply to different organs. Tea from alfalfa leaves is made by steeping 1 teaspoon of alfalfa leaves in 2 cups of boiling water for approximately 10 minutes, according to the authors of "The Dictionary of Wholesome Foods." The tea is bland, so adding flavoring may enhance the taste. But adding another herb, such as mint, may alter the medicinal properties. To make tea from the seeds, place 1 teaspoon of unsprouted seeds in 2 cups of boiling water and steep for several minutes. Afalfa tea made from leaves is most likely safe, but tea made from the seeds may cause harm if taken for a long period of time. Consult your doctor before taking alfalfa tea if you have an autoimmune disease, are pregnant or breast-feeding, have had a kidney transplant, have a hormone-sensitive condition or have diabetes. Do not take alfalfa tea if you are taking blood thinners such as products containing warfarin. 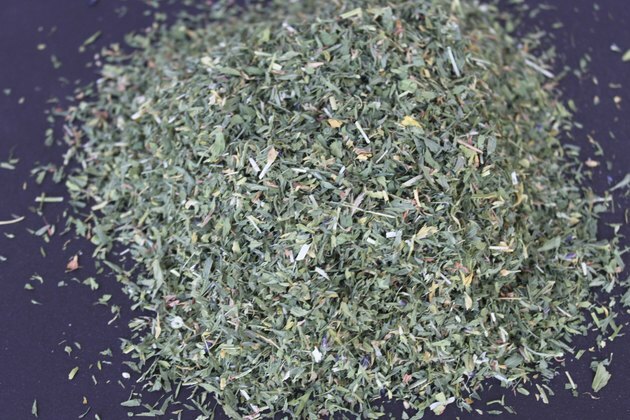 Talk to your doctor about taking alfalfa tea if you are taking other medications or supplements. Can Supplements Help Make Bile?